People often ask where my ideas for sculpture come from. My sculpture is nowadays always based on the human form. I have spent many years studying and drawing the figure – indeed during my teaching career, there was always a life model to work from and since then I was a member of a life-drawing group for a number of years. I feel that this intimate knowledge of the human form has stood me in good stead to such an extent that it has become an integral part of my working practice .In the past I experimented with complete abstraction, but gradually was drawn back to figurative sculpture. At one time my ideas were inspired by world events or tragedies – I made a series of stone carvings entitled ‘Earthquake’ all of which had the feeling of ‘rebirth and hope’ rising from the devastation of human tragedy. During the period of unrest in South Africa, I was moved to create a series of sculpture entitled ‘Apartheid’ with the figure or figures close together but with a sharp division between them. The idea was that we all come from one common source but are unfortunately often divided by race, colour or creed. Nowadays I mainly concentrate on the relationships and emotions of people; so many of my sculptures have two figures, or a family grouping as their subject. In contrast my single figures tend to have a feeling of strength, resolve or meditation. I am also interested in the interaction and movement of dancers, and have created a group of works entitled ‘Strictly Sculpture’ inspired by the popular TV programme ‘Strictly Come Dancing’ including Argentine Tango, Jive, Tango and Paso Doble. 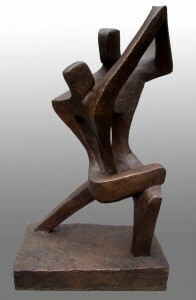 I go regularly to the ballet and other dance performances where I am inspired by the dances to get ideas for sculpture. It is said that creativity is 10% inspiration and 90% perspiration but in fact I, like many artists, am surrounded by ideas for sculpture which can be used to create my work. If you are not already on my emailing contact list, please let me know so that I can send you news and details of my exhibitions. Just email me at info@johnbrown-sculptor.co.uk. You are always welcome to visit my gallery and garden by appointment if you are interested in purchasing a sculpture.